Deng Geu led the comeback charge against Western Illinois. For the second consecutive weekend, the North Dakota State men’s basketball team hit the road as part of a four-game road swing. 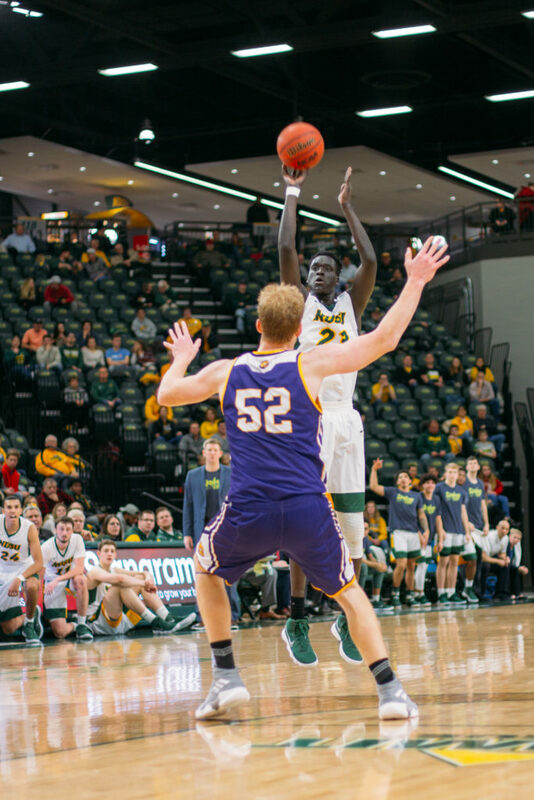 After stealing the first Summit League win away from home, the Bison pulled a comeback in Macomb to defeat the Western Illinois Leathernecks 78-76. Not for the first time this season, the Bison got off to a slow start. Five straight points by Kobe Webster gave the hosts a seven-point cushion inside the first five minutes of play. NDSU responded by turning to the bench and Deng Geu. The junior sunk his second 3-pointer of the early going and powered home a dunk to tie the game at 14-14. Tyree Eady converted a layup to give the Bison their first lead halfway through the first half. The Bison shooters then went cold. NDSU missed seven of their next eight shots, and Western Illinois pulled away. The Leathernecks led by as much as 13, following Isaac Johnson scoring five consecutive points. Eady played the role of the spark, as the Bison started the long fight back. An old-fashioned 3-point play and another made basket from behind the arc came either side of a Rocky Kreuser dunk, swinging momentum. C.J. Duff stymied the comeback with a 3-pointer for WIU to keep the lead at seven heading into the break. NDSU got inside at the start of the second half to pull within a possession. Sam Griesel finished off a fast break with a layup before Geu slammed home on the next possession as NDSU closed the gap to 46-43. The Bison scoring depth reared its head again to good effect. Vinnie Shahid hit from behind the arc and inside the paint of two straight possessions, and Tyson Ward made it eight points with another 3-pointer to give the Bison the lead. Geu converted two straight shots and one from the charity stripe, as the lead changed back-and-forth. The junior hit a 3-pointer to give the Bison a four-point lead with less than eight minutes left to play. Ben Pyle responded with a 3-pointer himself for the Leathernecks. The one-score margin remained until 4:14 to play. Shahid finished a 3-point shot through contact and converted from the free throw line for a 4-point play, pushing the margin to 71-67. Cameron Hunter sank the dagger into the Leathernecks with another 3-pointer to put the game out of reach late. NDSU was efficient in their shooting on the night. The Bison shot 54 percent for the game and just over 60 percent in the second half. From behind the arc, the numbers were even better. A 42.9 percent 3-point shooting percentage was well above the season average of 34.3 percent. Geu was the star on the evening for the Bison. In just 17 minutes off the bench, the Sioux Fall, South Dakota native produced 22 points, a career high. Shahid finished with 15, and Eady and Hunter each added another 10 from the bench. NDSU held a 42-7 advantage in bench points. NDSU close out their four-game road trip with a midweek jaunt up I-29 to Grand Forks to take on the Fighting Hawks. NDSU won the first meeting between the in-state rivals 67-65 just over a fortnight ago. The Bison return to the Scheels Center to host Denver to open up a four-game home stand 4 p.m. Saturday as the second part of a doubleheader following the women’s game at 1 p.m. Previous Previous post: Is Technology Going Too Far?